My 3-year-old hates anything that makes her hands dirty and avoids activities that make a mess. This means that she refuses to fingerpaint, which is pretty much a rite of preschool passage. For Mother’s Day her class made adorable handprint cards and her teachers told me that my card had a hand-drawn picture instead because they couldn’t get her to stop screaming about getting her hands in paint. 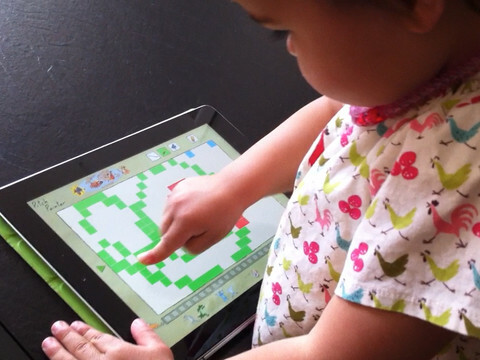 For kids like her who don’t appreciate the squishiness of a handful of paint, there are a slew of virtual fingerpainting apps targeted at preschool-aged players. 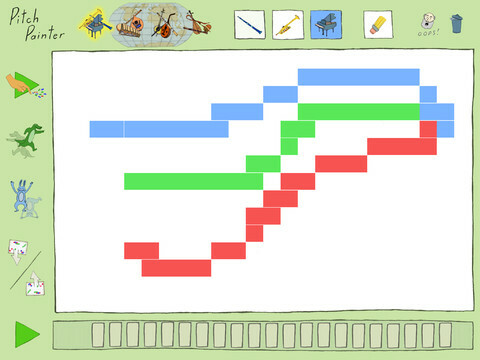 But Morton Subotnick’s Pitch Painter takes the painting app to a whole new level by adding a musical element to it and encouraging players to cross-develop art and music skills. While the picture is being painted on the screen, music is being created. Take a look at the screen shots – it’s hard to explain without visual aides. This very cool concept is enhanced by several customization options. Combos of 3 different instruments can be chosen from four regional selections, and the music can be played back in many different ways. Normal playback repeats the tune exactly as painted from left to right, or it can be reversed, flipped, or “scrubbed” like in more sophisticated music-mixing apps. Single notes or entire pieces can be erased, and the finished pieces can be saved and loaded for play at a later point in time. I needed to read through the instructions and give my daughter a quick visual tutorial before she could start creating. When she figured out what all of the icons did to change up the piece she was thoroughly engaged in the open-ended play. The “painting” showed up in large pixels, which means that her small and not-yet-fully-dexterous fingers could easily tap on the notes she wanted to erase. 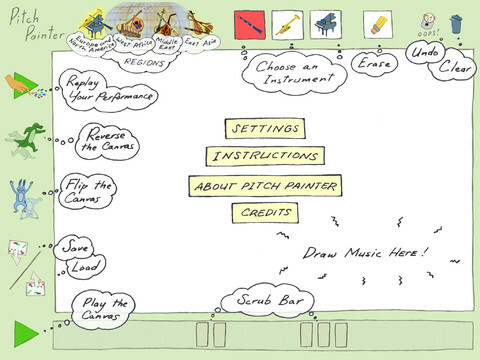 I’m a huge proponent of music and art being a part of a comprehensive educational experience so Morton Subotnick’s Pitch Painter is right up my alley. It’s head and shoulders above the apps that singularly address either music or art early-learning skills, and the download price of $3.99 reflects that. Also – your kid won’t scream at you because she doesn’t want paint on her hands which is a huge bonus.